YES, WE PLEASED THE COURT: Members of our Legal Lions mock trial team celebrate their performance at the district competition at the Lake County Courthouse on January 18. The Legal Lions now advance to the regional trials on February 15. Team members include seniors Hannah Taylor and Carter Callender; sophomore Connor Marrott; seniors Tad Brennan and Tommy Shero; and juniors Pierce Thomas and Emily Callahan. 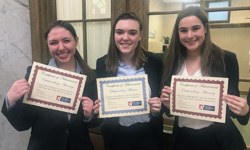 For the fourth consecutive year, one of NDCL's mock trial teams will advance to regional competition after successfully arguing in district trials at the Lake County Courthouse on January 18. When the gavels fell after a series of morning and afternoon trials, our students won 10 individual awards: seniors Tommy Shero, Carter Callender, and Julia Lombardo, best attorneys; sophomore Rylee Yackin, best attorney; seniors Tad Brennan and Hannah Taylor, best witnesses; and sophomores Connor Marrott and Corinne Sullivan, best witnesses. NDCL sponsored two teams in this year's competition: the Legal Lions and the Northstars. The Legal Lions defeated Andrews Osborne and Lake Catholic to be among just five of 16 teams to advance to the regional trials. The Northstars, our second team, won against Brush but lost in a close contest with Mentor despite earning three out of the four individual awards. Each year mock trial teams throughout the state focus on a single case for district, regional, and state competition. This year's case involves a motion to suppress evidence obtained by prosecutors from a drone that hovered over the defendant's home. Issues at trial include the Fourth Amendment's protections against unlawful search and seizure as well as reasonable expectations of privacy. Team members owe much of their success to the expert advice provided by their dedicated and generous volunteer legal advisors, including Mr. Martin Delahunty, father of Jackie '16 and John '17; Mr. Ryan Callender, father of senior Carter; Geauga County Common Pleas Judge Carolyn Paschke, mother of junior Garrett and freshman Mallory Sah; and Geauga County Assistant Prosecuting Attorneys Mr. Nick Burling '01 and Mr. Donovan DeLuca '05. The team's network of professional support also includes Cuyahoga County Common Pleas Judge Michael Shaughnessy, father of Megan '12 and Katie ‘18;Cuyahoga County Common Pleas Judge Deena Calabrese ‘89; Chardon Municipal Court Judge Terri Stupica, and attorney Mr. Matt Lallo '02, who officiated at scrimmages and provided valuable feedback. Attorneys of the Squire Patton Boggs law firm hosted a scrimmage between NDCL and St. Edward High School in preparation for the competition.